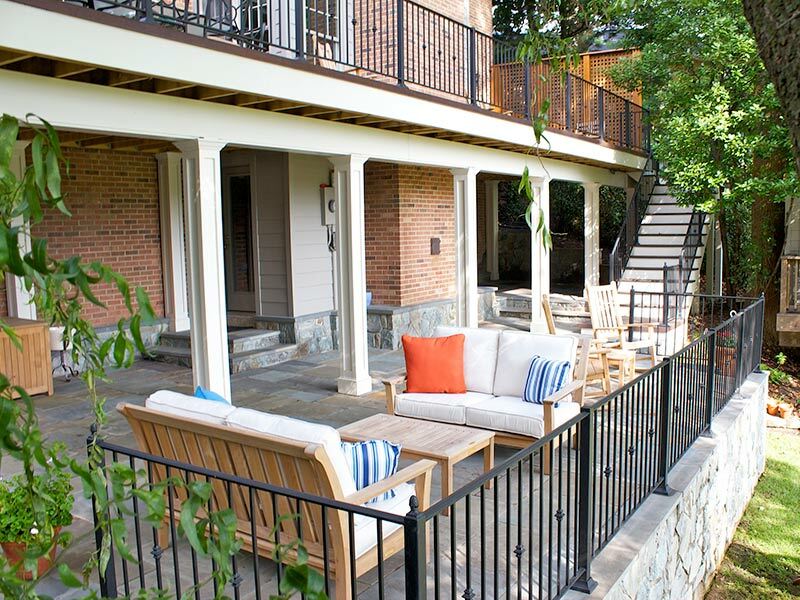 This multi-level patio and deck design project in North Arlington, Virginia presented a great landscape challenge: making the best use of an amazing view while dealing with a steep slope. 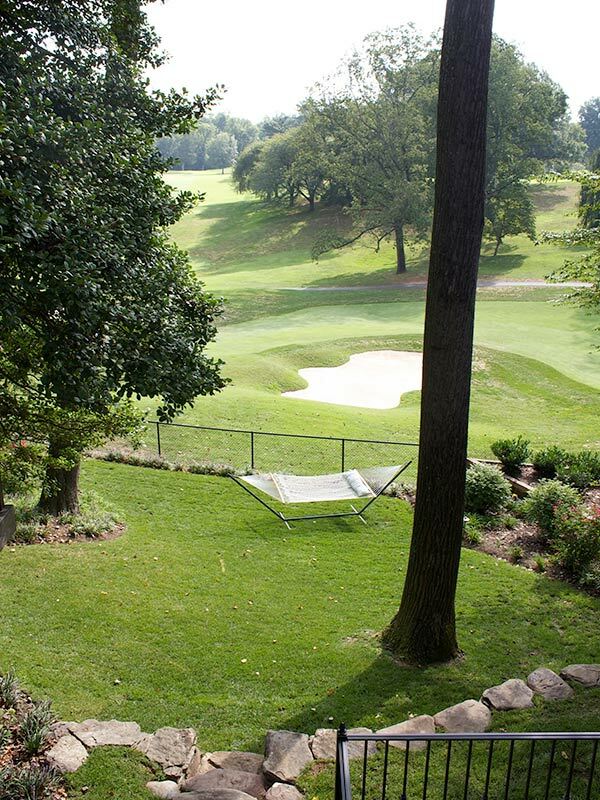 But overcoming this obstacle to create something one-of-a-kind made it fun from beginning to end; and it didn’t hurt that we had a riveting golf course view and fantastic customers. 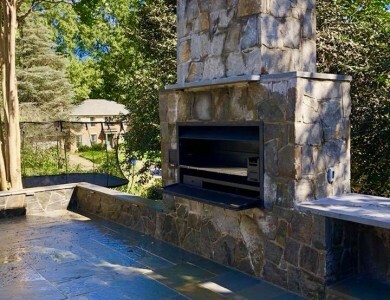 To accomplish this job, we built a large retaining wall with a system of steps built from a mix of Carderock Building stone and Dove Gray Building stone. 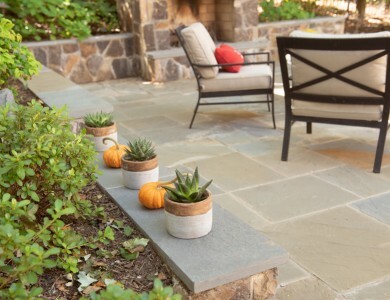 We used those two types of stones because they create a full range of gray colors that coordinate well with the colors of the flagstone patio, which the wall supports. We also created a deck design, including it above the multi-level patio structure, and brought in a talented company to build this portion of the job. 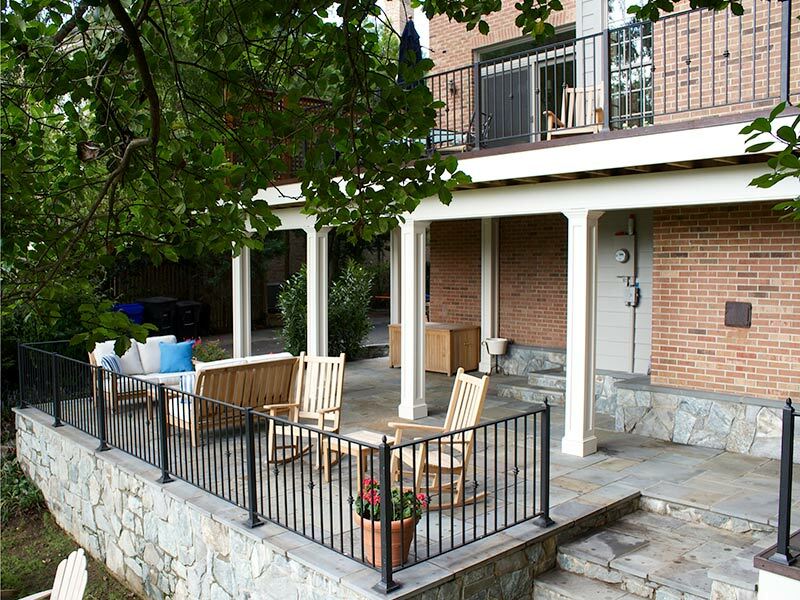 Once construction of these hardscapes was complete, we began work with a custom wrought iron company to build the bordering railing system. 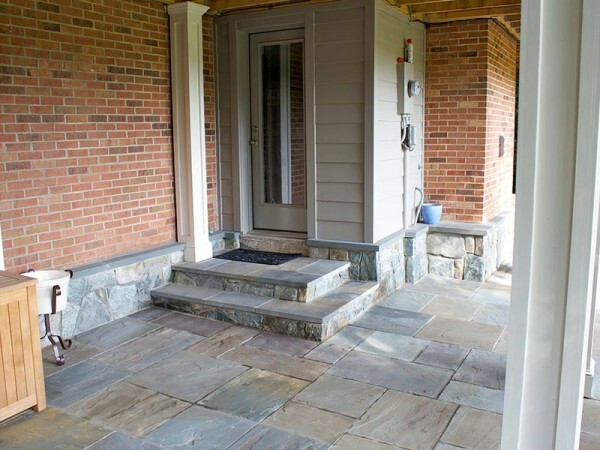 What makes this project unique is that everything was set in masonry as opposed to pavers. We did this for a few reasons: first, we wanted the space to be a true extension of the house. The patio needed to be as high quality as the construction and interior of the home. 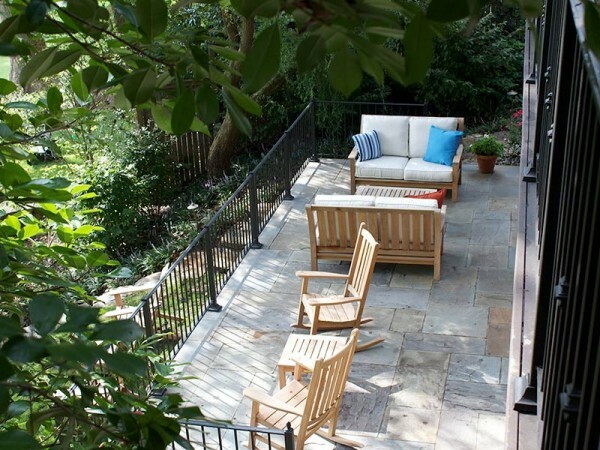 Additionally, the deck, which is supported by the multi-level patio, needed to be set on large concrete footings. Finally, our landscapers installed all the plantings that surround the multi-level patio space. The plant design was crafted with the intent to promote privacy, provide seasonal color, and create a landscape which lends itself to a crisp manicured appearance. 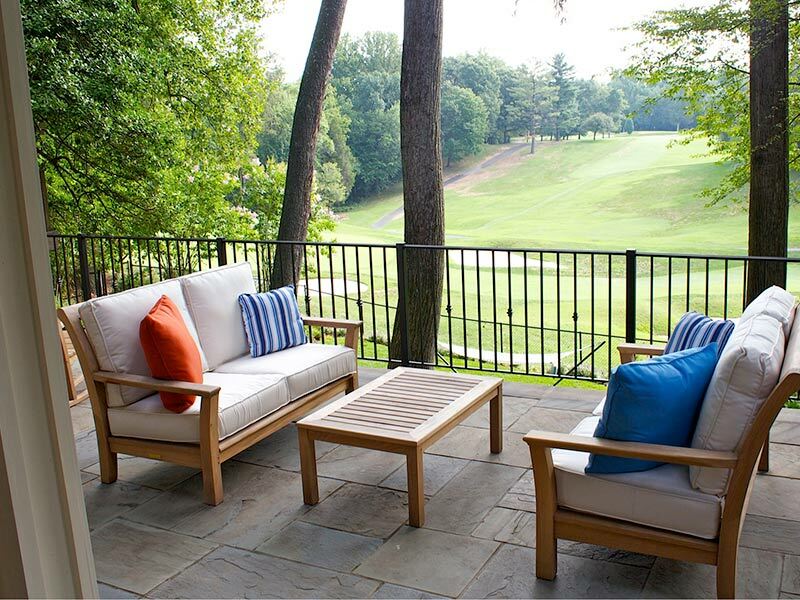 By combing these unique features in this North Arlington deck design project, we created an outdoor living space that is ideal for relaxing or hosting guests, while enjoying an entertaining and beautiful golf course view. 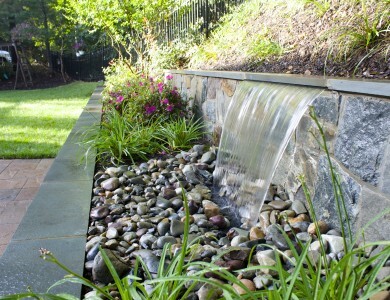 Are you looking to make the most of a landscape with a view? 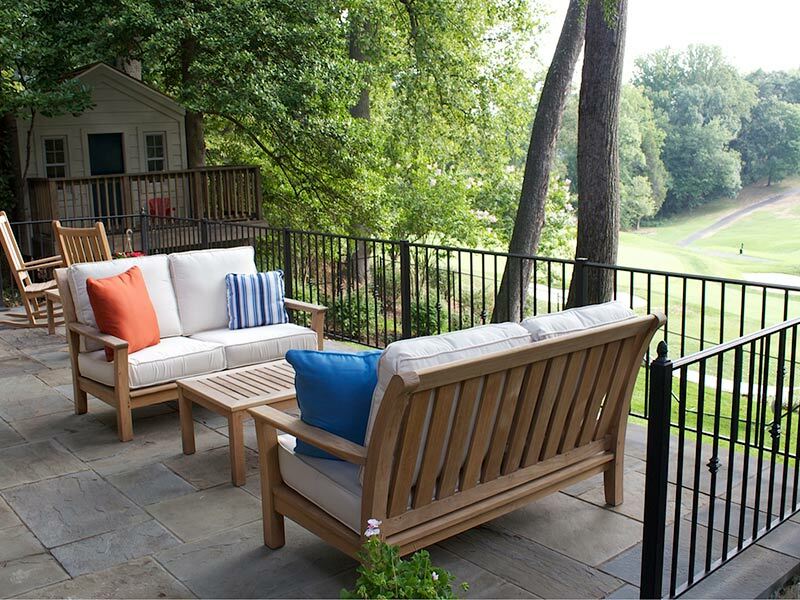 Or create a unique deck design like the one we created for this North Arlington home? 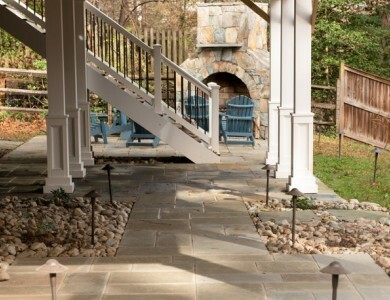 At O’Grady’s Landscape, we help homeowners throughout Northern Virginia design and build outdoor spaces with all the elements they love most. 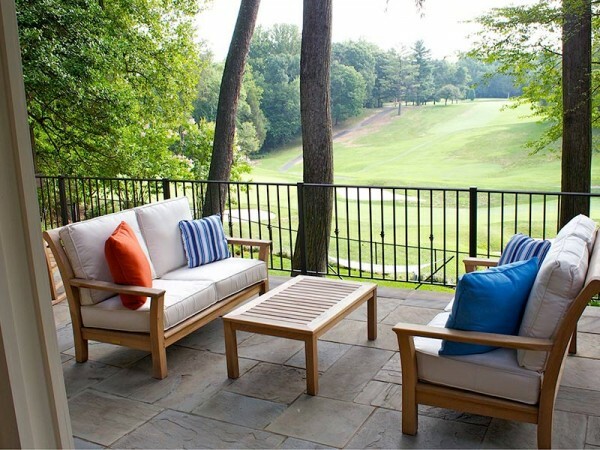 Whether you want a multi-level patio, deck design, or plant design similar to that of our North Arlington clients, or you want help creating a custom landscape design of your own, we can help. Call us at 703-533-5001 to schedule a consultation if you live in Great Falls, the City of Falls Church, McLean, Vienna, or North Arlington!